This is the first volume collected and illustrated by Kurt Brugel. 30 illustrations have been created for 10 short stories collected. This volume has Mr. Fox’s earliest story (1944) to his last story published (1982). There are all types of stories being told. They range from 2 spooky/creepy (The Weirds of the Woodcarver and Rain, Rain, Go away! ), 3 sword & sorcery (The Return of Dargoll, The Holding of Kolymar, and Crom and the Warlock of Sharrador), 4 cosmic adventures (Heart of Light, The Rainbow Jade, Temptress of the Time Flow and The Man Who Couldn't Die) and 1 history lesson (Cleopatra). 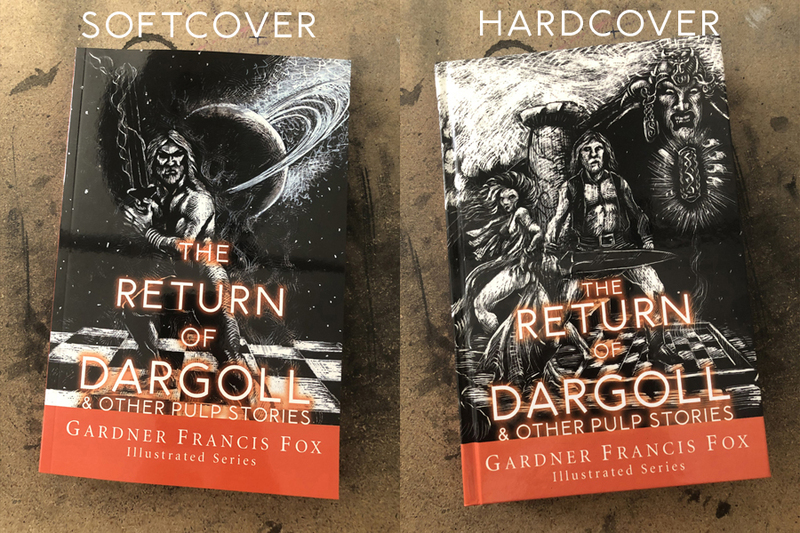 The are some of the 30 scratchboard illustrations for The Return of Dargoll & Other Pulp Stories, illustrated exclusively for The Gardner Francis Fox Library by Kurt Brugel. Garrison found the game board in the ruins of Teotihuacan in Mexico. At first glance, he thought it was a game board. It was a marble flat, one-yard square, of multicolored stone with a raised edge an inch high about what appeared to be its playing surface. It was when he got it home to the United States and unpacked it, that he realized it was something unique. This is the incredible story of one of the most wanton women in all history. There have been strange creatures generated in the billions of year that Earth has known; the strangest of these—the Primal Ones! For the smell of rain was a stench in his nostrils, reminding him of death. Carbon is the basis of human life; and here in the crypt was a figure made of pure diamond could it be human could it be alive? A priceless jewel; perhaps the answer to the Universe. Was this the end of the universe, or the beginning? IT WAS AT EVENTIDE that the summons came to Conmoral. The call came on the edge of the wind that sighed and whispered as it ran across the meadows and the tarns of fabled Kolymar, and Conmoral listened with his grey head tilted sideways and a sigh for the forgotten years gathering in his throat. There was much in the world that he had forgotten, much that was changed. Slowly, reluctantly, the man who had been dead returned to keep his promise. For they had offered the puny Earth Thing eternal life—for the secret which would obliterate his world! For unremembered eons the Thing had slept. For a million years it had quested through the star worlds of its dreams, until if lived only as a faint legend in the race memories of mankind. But now the time had come for man to recall its name, and to worship it once again. Noorlyethin arose and returned to the world of men and women. Here’s a process video of the Crom the Barbarian illustration. We are accepting International Orders!